MCM7 antibody recognizes the DNA replication licensing factor MCM7, also known as CDC47 homolog, homolog of S. cerevisiae Cdc47, minichromosome maintenance deficient 7, protein phosphatase 1, regulatory subunit 104. The antibody has been extensively validated for western blotting. Mouse anti Human MCM7 antibody recognizes the DNA replication licensing factor MCM7, also known as CDC47 homolog, homolog of S. cerevisiae Cdc47, minichromosome maintenance deficient 7 or protein phosphatase 1, regulatory subunit 104. The protein encoded by MCM7 gene is one of the highly conserved mini-chromosome maintenance proteins (MCM) that are essential for the initiation of eukaryotic genome replication. The hexameric protein complex formed by the MCM proteins is a key component of the pre-replication complex (pre_RC) and may be involved in the formation of replication forks and in the recruitment of other DNA replication related proteins. The MCM complex consisting of this protein and MCM2, 4 and 6 proteins possesses DNA helicase activity, and may act as a DNA unwinding enzyme. Cyclin D1-dependent kinase, CDK4, is found to associate with this protein, and may regulate the binding of this protein with the tumorsuppressor protein RB1/RB. Alternatively spliced transcript variants encoding distinct isoforms have been reported (provided by RefSeq, Jul 2008). 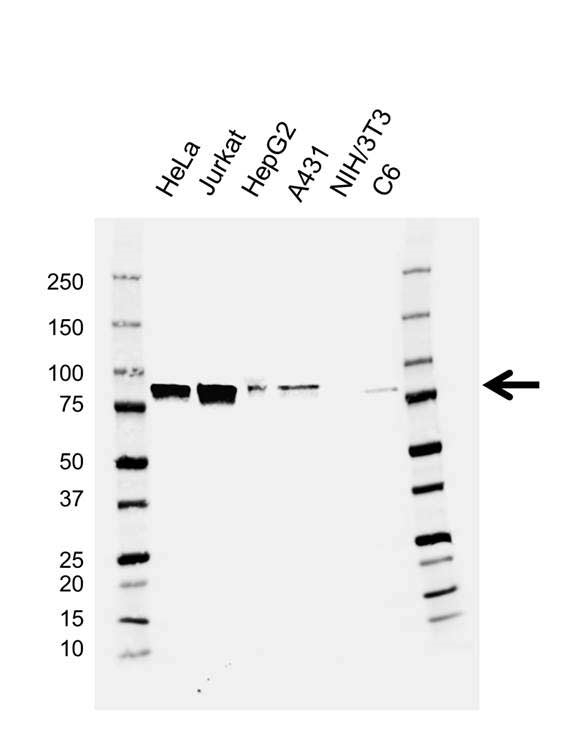 Mouse anti Human MCM7 antibody detects a band of 81 kDa. The antibody has been extensively validated for western blotting using whole cell lysates.